Arguably one of the best VoIP phones available today. Features a large graphical grayscale display, 24 programmable call appearance / feature keys and 11 fixed feature keys. Each button is labeled directly from the Avaya IP Office system, which means goodbye to paper labels! 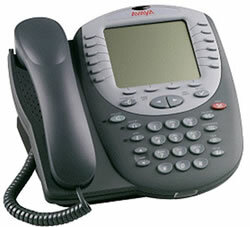 The Avaya 5620 VoIP phone also includes a built-in headset jack and a full-duplex speaker phone for audio conferencing. This unit can be wall-mounted or used on the desktop with a 7 position adjustable stand. Socket for use with the EU24, 24 button expansion module.